Saphinda Primary School in Umlazi, KwaZulu-Natal welcomed a very special visitor on their first day at school in 2019. Deputy Minister Thabang Makwetla visited the school on 09 January. 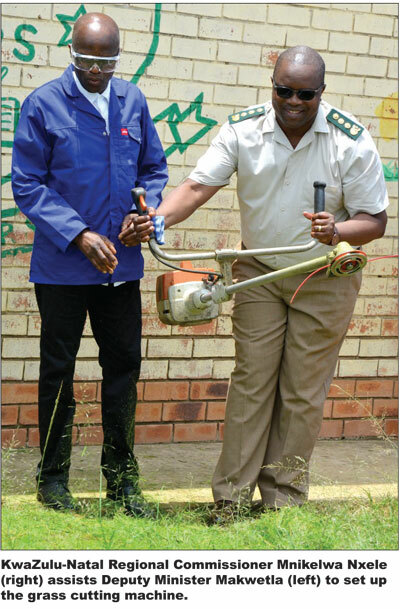 He joined correctional officials, offenders and community members in painting walls, repairing broken windows and cutting grass around the school yard as his contribution to the department back to school campaign. This initiative is an attempt by the department to give offenders an opportunity to give back to communities they have wronged through establishing relationships with local schools. 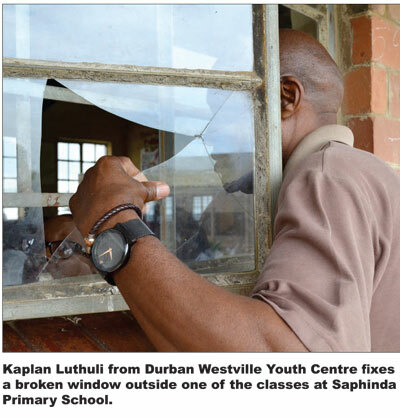 Addressing the pupils, Mr Makwetla said offenders came to renovate their school as an attempt to show parents that they are not proud of their wrong doings. He said their labour is also their way of warning school children not to repeat the same mistakes they have done and end up in jail. He beseeched teachers at Saphinda to teach learners to resist violence and be aware that resorting to using physical violence against others is unacceptable in society. Saphinda was established in 1966 as a lower primary school with only two classes. Now it is a full service school with classes from grade R to seven. It has more than 40 educators and 1300 learners. The School Principal, Ms Thenjiwe Zulu said the learners enrolled at the school do not pay fees and most of them come from disadvantaged homes with government grant as their only income. “Today was a special day for the school, the department saw that we were in need and they came to offer help,” she said. She said the school already has an existing partnership with the department and she is looking forward to expanding the relationship. Mr Makwetla ended his visit by handing lunch packs to school children. He was accompanied by Chief Operations Commissioner Mandla Mkabela, KwaZulu-Natal Regional Commissioner Mnikelwa Nxele, Western Cape Regional Commissioner Delekile Klaas, acting Deputy Regional Commissioner Bhuti Mchunu, and other DCS and Department of Basic Education senior members.